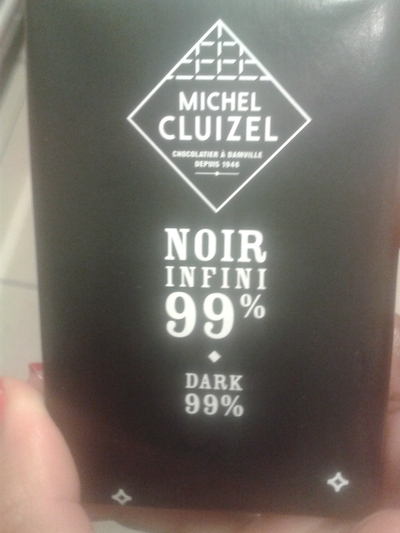 Michel Cluziel Noir Infini 99% bar (£2.00) is a real treat for chocolate afficiandoes. The dark chocolates is made out with a blend of the best single origin cocoas. The high cocoa contents and powerful aromatic hints makes for a unique moment. Like the finest wines, the Michel Cluziel chocolates bear the name of their plantation which allow to make up an intense aromatic range. I am proud to say I've tried and enjoyed the Noir bar. It is definitely not a bar to eat, but one to grate, add, and chop into dishes, or chocolate recipes. You only need to use a small amount because of the high cocoa content, which makes it a great product for longevity. It's definitely one for the store cupboard. I've only enjoyed it in a recent brownie recipe and some hot chocolate. You do need to add a fair bit of sugar for sweetness, but the rich taste makes it a luxurious treat, whether you're drinking, or baking with the chocolate.